How to house-proof your child and also keep the home safe for your little one. Know when to child-proof and when to house-proof. I am more of a “house-proofer” than a “child-proofer.” By that, I mean that I would generally rather teach my child to not touch something than to put bubble wrap around it. There are times, however, that it is wise to go the child-proofing route. “If your son or daughter develops a fondness with the toilet seat in the guest bathroom, shut the door and keep it closed. We promise, you will have enough opportunities to train your pre-toddler and toddler in the living room and kitchen” (Babywise Book Two, page 109). As you are house-proofing your baby (see Child-Proofing vs. House-Proofing), there are a couple of things to keep in mind. While in general I don’t rearrange my house for my children, there are some items I would be devastated to lose. Well, I can only think of one off the top of my head. I have a vase that is my Braxston vase. It is a vase I got when I lost him. For me, it is one of the few tangible items I have of him. That is an item I do not mess around with. I make sure it is up high and out of reach of little ones. If you have items that you would be very upset if it got ruined, absolutely put it out of reach. Yes, the idea is that your child will not touch things that are “no”–BUT without a doubt your child will test those boundaries and you don’t want a test to end in something you adore being ruined. There are some things you want to do in order to protect children. For a short time before she turned one, Kaitlyn was fascinated by outlets and really wanted to stick her fingers in it. I put outlet covers on our outlets. You want to keep your children safe–you just want to make sure you are going for real safety and not trying to prevent every single bump and bruise that might come along. Children do learn from falls. As the opening quote indicates, you can limit your training grounds to certain areas of the house. You don’t have to keep everything open for testing at all times. Start with small areas and slowly expand where your child is free to go as he shows ability to handle that freedom. In our previous home, I had the baggies and like items in a drawer that was low enough for little ones to get into. In order to prevent a mess I didn’t want to deal with, I put a latch on that one drawer. All other drawers were okay and were used as our training drawers, but that one drawer was a drawer I didn’t want to clean up if it became the testing ground. 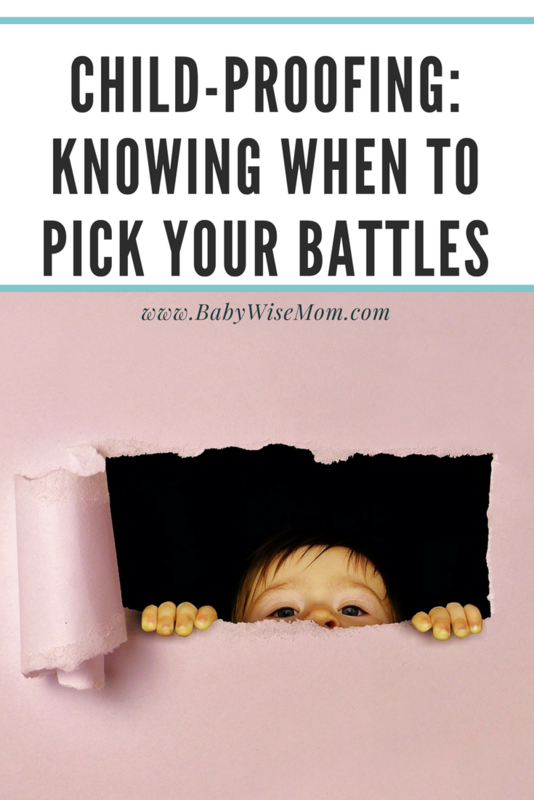 So as you are teaching your child boundaries, keep these things in mind so you can pick your battles.The funnel easily applies to this as it does to other areas in your child’s life. Great perspective! We did similar things with our first born (now 2.5 years old) and are gearing up for house-proofing our second little girl, six months old. Your timing (once again!) is perfect as I needed the reminder that it's okay to child-proof some things as you work on training in other areas. Thank you so much for all your insight! Love this! Thanks so much for this post. My little girly is just starting to crawl, and is already into a ton of stuff and I was debating whether to move stuff or not. I have to put cords and stuff up and I am going to latch under the sink and bathroom sinks so she can't get into anything poisonous, but other than that I think I am just going to keep everything how it is. So with Olive we lived in a very small apartment in NYC. She was taught that she was absolutely not allowed in the (6×12) kitchen. But with Milo, he is now 18 months and just so…destructive! It's the oddest thing to me. If he is put down anywhere he almost immidiately starts to run. My grandmother said something about 2 year olds being blenders without a lid and this describes him perfectly. Because of this he is only allowed to roam free in one room-my daughter's room. We still have a relatively small (1200 sq ft) house so my daughter's room doubles a a playroom. If he is not there with the baby gate closed, then he's in his pack n play or in his high chair, no exceptions. My husband will come into the house holding him sometimes and mistakenly put him down and immidiately he grabs a remote and runs just RUNS. I have been thinking a lot lately of how different Olive was, that she was good deal more timid and would just stand and play quietly. Milo just doesn't. A few months ago I walked in to find that he had climbed on my Olive's bed, and then onto her nightstand! He was only crying because he couldn't get down. So, I've realized that training with him is going to have to wait. I can see that he is starting to have a little more understanding, but not nearly enough to really train him the way I want to. I had some things like that that I had to wait for with Olive. Eating, for example, was something I just let go of until she was 3.5 and now things are much better. Sometimes you just have to wait for you kids to be ready to be trained for a freedom. Milo is simply not ready for the freedom to roam around my house, so he does not get the privilege.